We absolutely love seeing El Paso and Juarez natives excelling in the fashion world! So we’re especially thrilled to tell you about Leigh Elena Navarro, 1996 Coronado High School grad, who will be visiting the city next week from her home in Austin. This gifted designer and entrepreneur has her own design line, known as LeighElena, featuring jewelry and other accessories that reflect her clean and interesting design aesthetic. After graduating from the University of San Diego with a degree in Spanish and business, Navarro spent a number of years working in fashion and high-end retail in Los Angeles and New York. She moved back to Texas in 2005 to start her jewelry business. Lots of people don’t know what they want to be when they grow up, but you could say that Navarro found her calling at the age of five. That’s when she began learning how to fuse enamel and glass together: her first teacher was her mother, Susan Navarro, a talented enamel artist. As a child, Leigh helped her mother at art fairs and then started creating and selling her own hand-made jewelry. Today Susan helps her daughter. 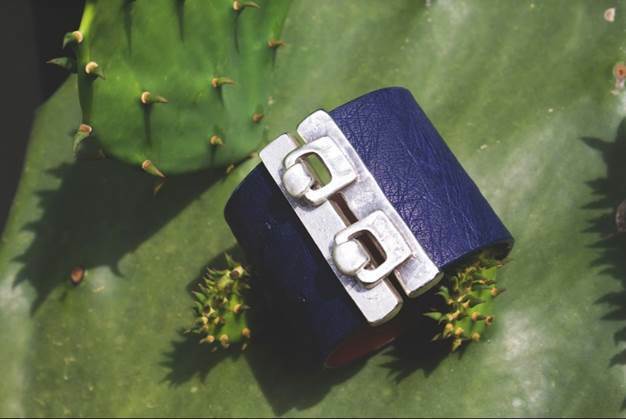 Her signature pieces include contemporary cuff bracelets featuring distinctive metal clasps. 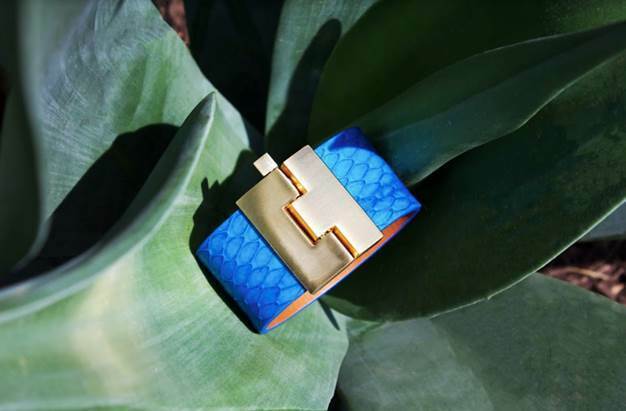 After a couple years in her new business, she began using leather and genuine exotic skins, such as alligator, stingray, python and ostrich, and the brand took off. 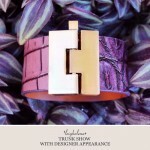 The bracelets, in vivid dyed leathers and natural colors, are unique and striking. 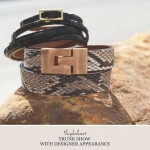 Since she started the LeighElena line, the bracelets have developed an international following. They have been featured in both fashion and lifestyle magazines such as Southern Living and Lucky. 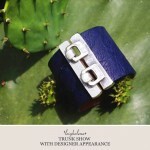 Her accessories are carried at both large retailers, such as Anthopologie and Neiman Marcus, and small boutiques. She also is inspired by what she sees on her frequent trips in the United States and abroad. Navarro still has relatives in El Paso, including her father and his sisters and some cousins. 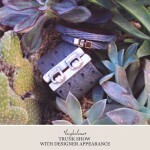 She is looking forward to visiting this week for a trunk show at Tres Mariposas. It will be just the second time her work has been spotlighted in her hometown; a few years ago she showed her accessories at the Ruby and Lola store. 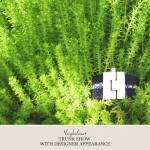 What can shoppers and friends expect at the trunk show? “I will have my best pieces from my collection with me,” Navarro says. “And there will be surprise gifts with purchase, too!” she says. Where can you see LeighElena accessories? The news is full of major retailing chains closing stores – or closing their doors completely. Just here in El Paso, the Sunland Park Macy’s was one of more than a hundred marked for closure and across the street, the long-time Sports Authority store closed when the whole chain was liquidated. Yet unemployment has been down and salaries have been creeping up the last couple of years. So what is going on? If spending hasn’t come to a halt, what do customers want outside of e-commerce? With all of today’s technology, people do not want to become simply robotic consumers. We still need to recognize the “human element.” One takeaway: Since it is easy to get so many needs taken care of at the click of the cursor, consumers have developed into more discerning shoppers. In many ways, the act of purchasing is an expression of identity. According to Boston Consulting Group, BCG Perspectives, “millennials are changing the face of marketing forever.” In the U.S., 50% of 18- to 34-year-olds believe that the brands they endorse “reflect their personal character and values.” When they do shop in person and not online, they want a unique experience and unique products appropriate to their lifestyle. A “curated” product mix. Today’s inventories should reflect a point of view and a lifestyle. For instance, my store has recently changed its product mix to reflect a new take on fashion. We see that women want relaxed fashion that is still put-together with an element of luxury. More than ever, today’s consumer puts together her own look to express her unique personality. Women in particular like products with historical and emotional connections. 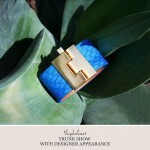 Take for instance jewelry by Temple St. Clair, who designs with an artist’s eye and explorer’s heart. 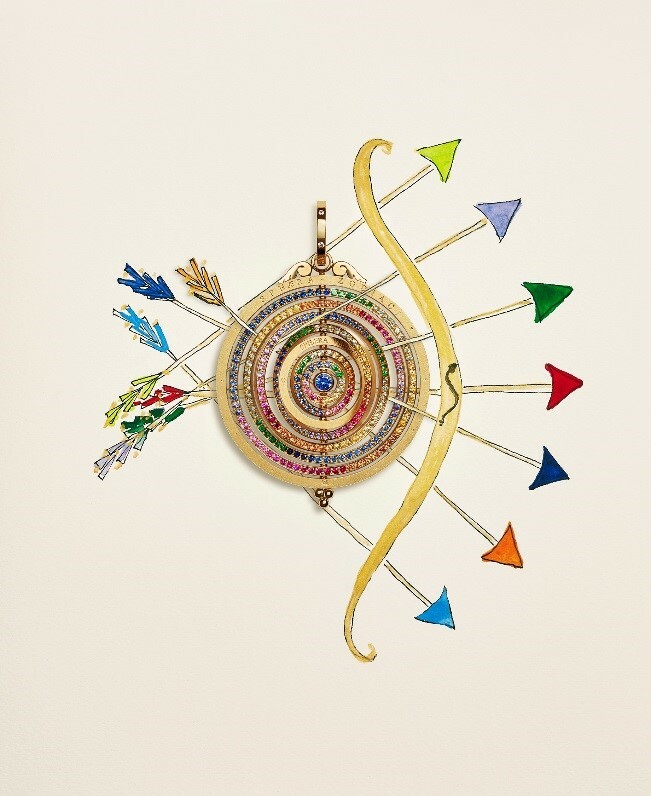 She uses gold and rare colored gems to illustrate universal narratives of the earth and cosmos. Unique and authentic resonates with today’s consumer who can be overloaded with tech. Customers also seek out items that are interesting and one-of-a kind for their home. In our new home and gift area, for instance, we have onyx items that came from a mine where intense heat from an adjacent volcano created unusual variations. Rich colors and patterns in the onyx pieces ooze a sense of earthy beauty that only Mother Nature can create. A more personal store brand. Fleener says that stores that are succeeding today “are much more than simply a storefront with a name.” He notes that they’re a very personal brand in their community. Customers feel a real affinity for the business and its staff, and shop there to support c the local community. El Paso is a distinctive, unique city where people embrace its special culture and support its businesses. A personal shopping experience.Successful store have highly engaged customers and a staff of associates who see their primary responsibility as building relationships. Associates get to know their customers’ tastes and become their personal shoppers. If there is one holiday when you want your gift to be just right, it has to be Mother’s Day. Especially in our part of the world, Mother’s Day is a major celebration. People want to be sure they let their moms and madres know they are cherished and adored. But what do you get the woman who means so much to you? It’s not easy. Flowers are nice, even if they don’t last long. Chocolates are a sweet choice, but they go faster than the flowers! Clothes are appreciated if you know her size and tastes. However, one of the greatest no-fail Mother’s Day gifts ever is a handbag. It is an indulgent yet useful present that’s one-size-fits-all and always welcome. The good news is you can find a purse that will be as individual as she is. Think of who she is and what she likes and the rest comes easy. Be sure to tell her exactly why you chose the handbag for her. When my son was growing up, his gifts to me came with a note that started out “I hope you like it” and ended with why he picked that present. Here’s some inspiration for finding the handbag that’s right for your mother and how to tell her why you picked it. 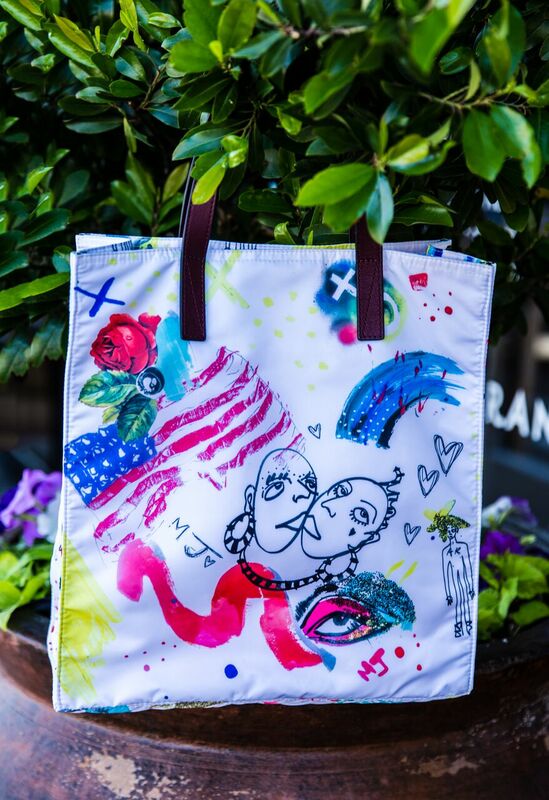 • For the artist, fun-lover or zany mother: “Mom, I love your artistic side, so I wanted you to have something creative and fun.” Marc Jacobs designed this bag’s colorful collage print by hand in his Paris apartment while he was on vacation. 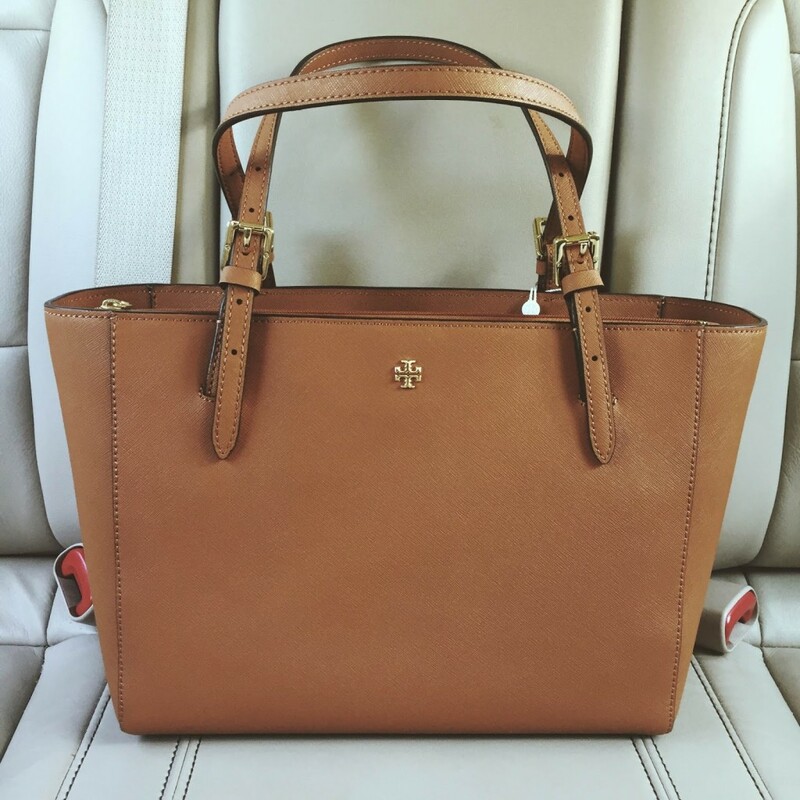 The Tory Burch York tote is a classic made of saffiano leather that it is more scratch-resistant and generally easier to care for than nappa leather. With convenient compartments for organization, adjustable straps and a good price for a designer name bag, this is a foolproof gift. 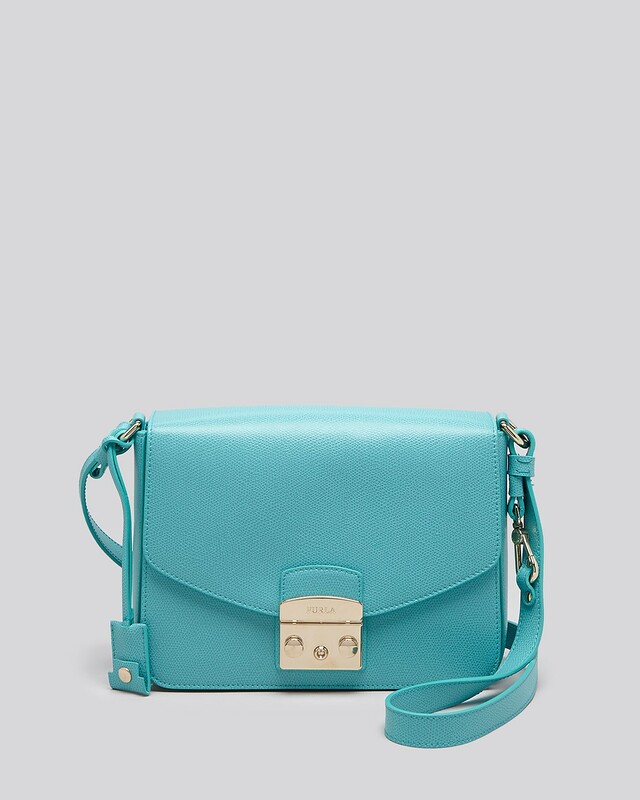 This mini cross-body style is adorable and just big enough for a phone, credit card, driver’s license, some cash, lipstick and keys. 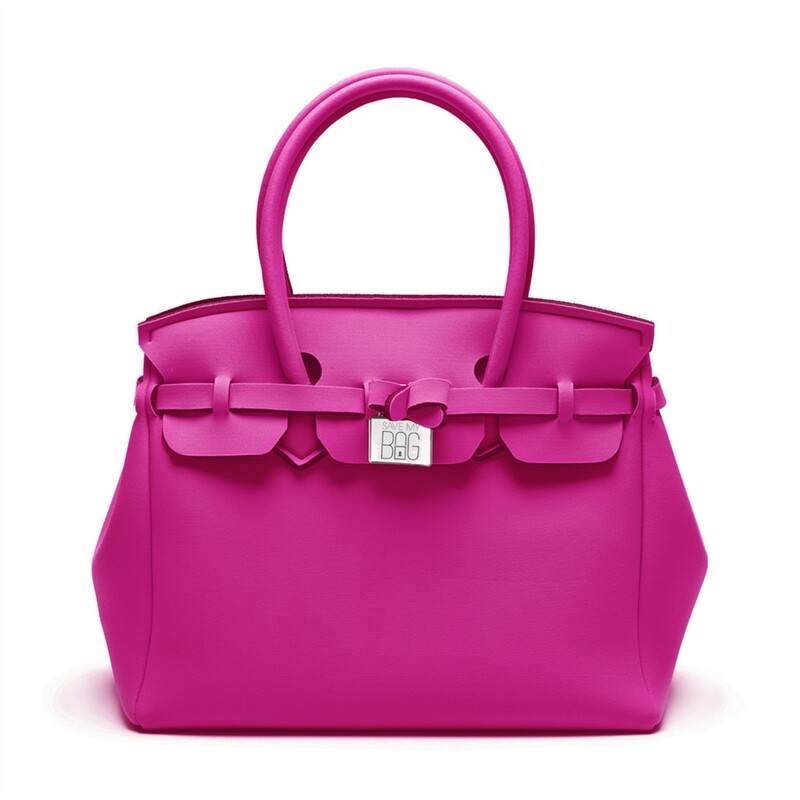 This one is from Furla, the nearly 90-year-old Italian handbag and accessory company known for elegance, femininity and artisanal details. The designer behind this bag by Save My Bag is Valentina Agazzi of Bergamo, Italy. She was a fashionista who made neoprene fabric covers to store and protect her vast collection of designer bags. Her bag covers evolved into an ultra-hip, inexpensive line of fun bags made in Italy. 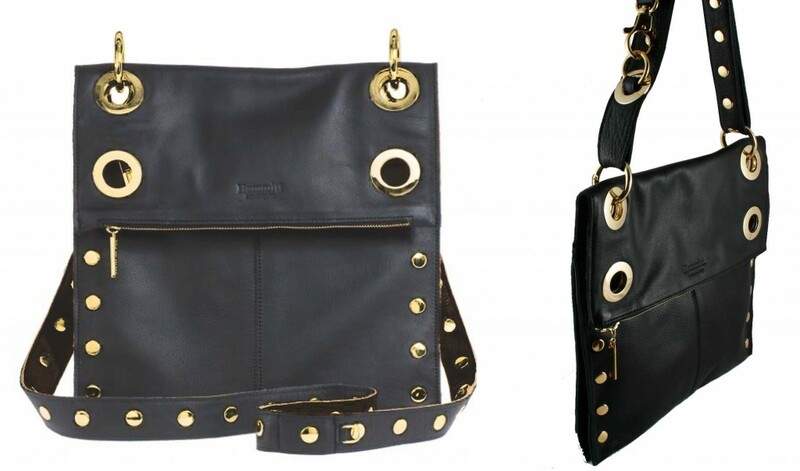 Hammit handbags are known for several features geared for travelling. Every bag has a crossbody stap, which is a must, both for travel security and ease. They also have well-designed pockets, compartments and a place for a cell phone, essential for staying organized on the go. Hammitt is based in Los Angeles and the bags are predominanty U.S. made, a rarity! 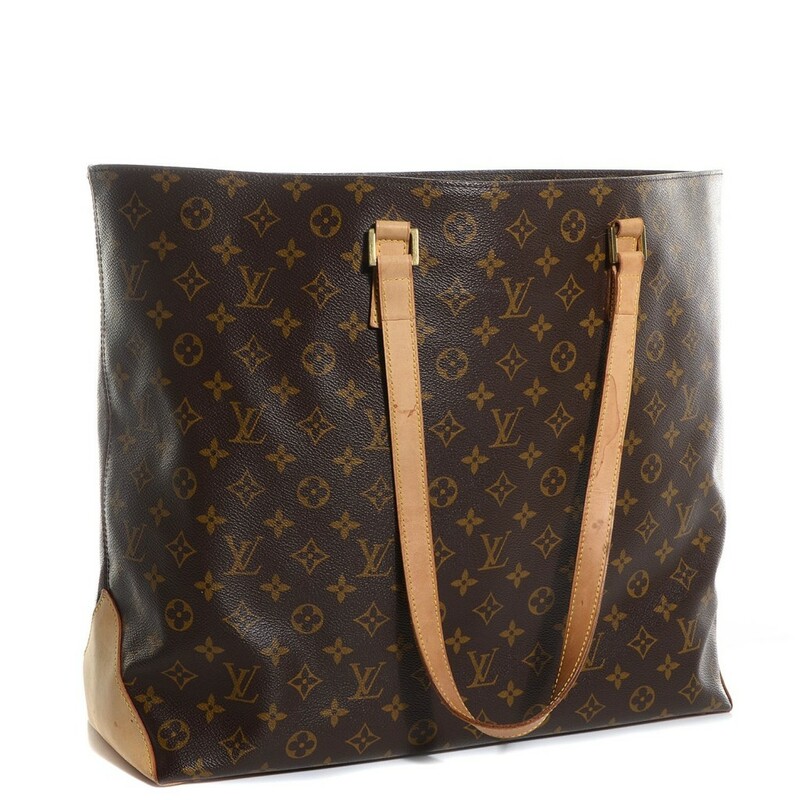 If your mother is a collector and conossieur of fine designer clothes and accessories, she will truly be touched by your thoughtfulness and generosity if you present her with a new or vintage bag by Louis Vuitton, Celine, Chanel or other designer. This is just a sampling of handbags to get you thinking about what your mother might like. El Paso has lots of choices, including bags by Coach, Michael Kors and so many others. Have fun shopping and have fun matching the bag to your mom! Denim never goes out of style, right? You may not have thought about it or realized it, but denim and jeans have been on the back burner for the last few years. Have you noticed? Women have been wearing black leggings, skinny leg pants and yoga pants in place of jeans. Well, it’s true – but I’m about to tell you that denim is back. And, of course, I’m about to tell you this classic is back in a new ways with modern tweaks. • Today’s denim trend is about a lot more than jeans. In years past, denim was associated with blue jeans, maybe a blue jean jacket now and then. Silhouettes beyond the jean are shirts, off-shoulder blouses, dresses, jackets, fly-a-way tops and rompers. • Now we are seeing a whole new denim dimension added to this sturdy cotton fabric. Chambray and tencel are the best new complements in the denim universe. Technically, all three fabrics are woven differently, made from different raw materials and represent different weights, but the fashion world is grouping them together this year. • Watch for more diversity in the classic blue denim. From very dark indigo to pale washes, the color intensity of denim runs the gamut now. Generally the lightest colors are in blouses and other tops, as well as sundresses. 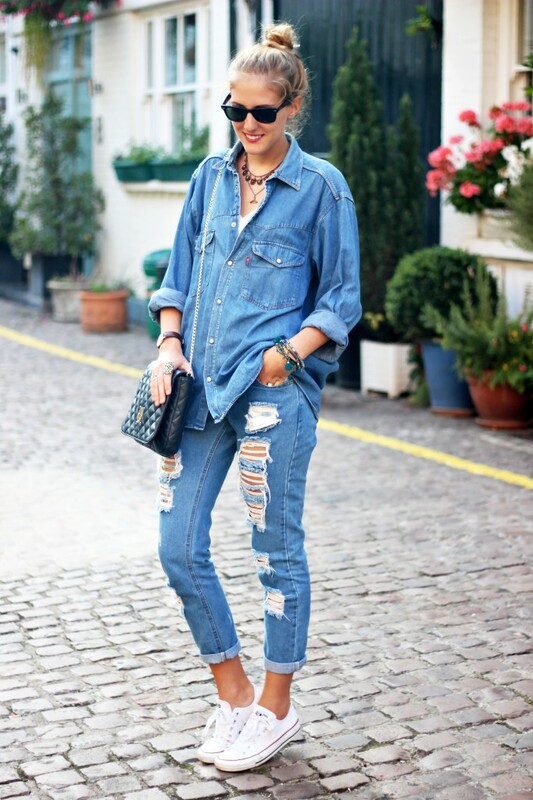 • Designers are working the denim on denim trend. 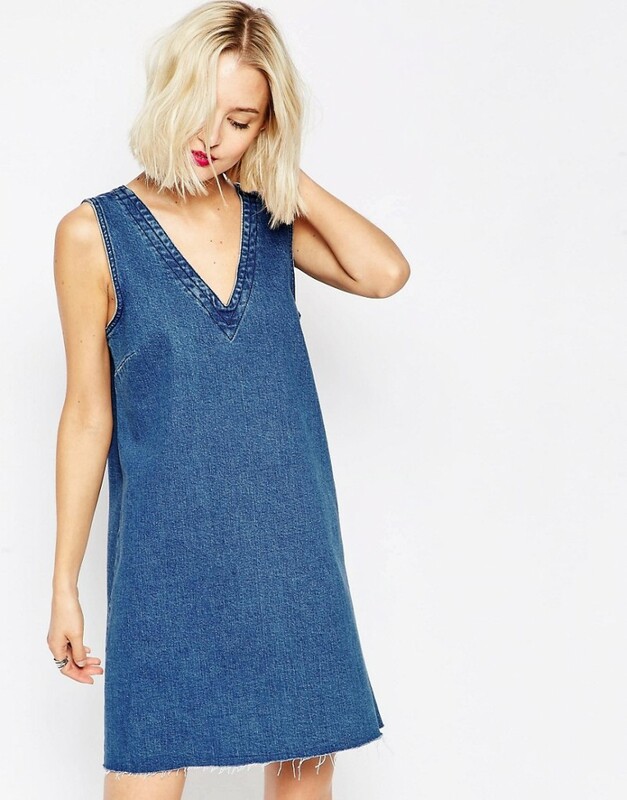 Does this mean matchy-matchy denim from head to toe? Yuck! Instead what is on-trend are varying weights and washes, mixing darks and lights, mixing denim with lighter chambray or tencel, mixing blue denim with white or black denim, or mixing distressed jeans with a solid blouse or jacket. • This is a time for fabric innovation in denim, with surprisingly soft-handed fabrics and stretch technology. At Tres Mariposas we recently sold out of a denim jacket that was so super-stretchy that it felt like a sweater when you put it on. Literally, you couldn’t try it on and not buy it. • For that effortless cool-girl vibe, add a pair of distressed or ripped jeans to your denim rotation. It’s meant to look a bit messy to show off your slightly wild side. • Blue jeans are more fun than ever with a wide variety of styles. Cropped, skinny, flared, cuffed, higher rises, wide legs, you name it. The most advanced silhouette is a cropped flare. But most of us can’t quite move on from our skinnies. • A denim shirt can be your closet’s MVP. So versatile, with endless possibilities. Layer it under, layer it over, do the casual mixed with dressed-up pieces thing. Bottom line: Make room for more denim pieces in your wardrobe this year, as denim and its sister fabrics are back and here to stay. As I wrote last week, I have been on a family reunion in New Zealand. 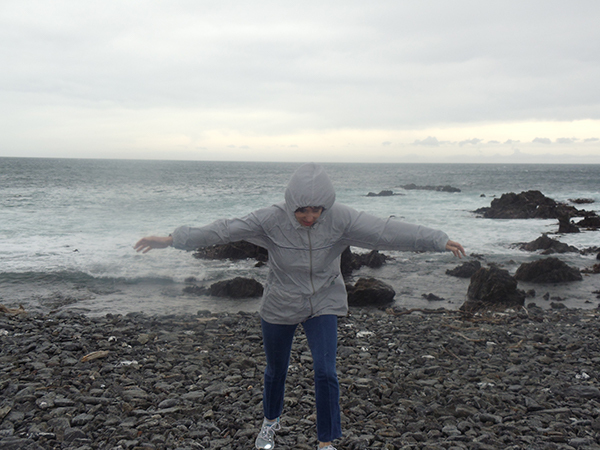 I absolutely loved the country and all the fun outdoor activities we enjoyed. It was a trip to remember. We learned a lot about the country’s history and culture – and we also learned to wear the right clothes for whatever came our way. • Wind shirt. A wind-resistant shirt or windbreaker was just the thing for our excursion in the Wellington area to Terawhiti Station, home to both New Zealand’s most modern wind farm and the dramatic Seal Coast. And I thought El Paso had strong winds in the spring! 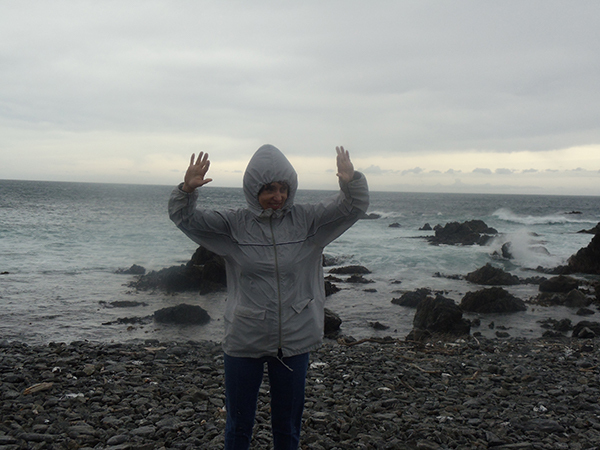 We had to work hard to stay upright as we viewed the coast and a colony of New Zealand fur seals. 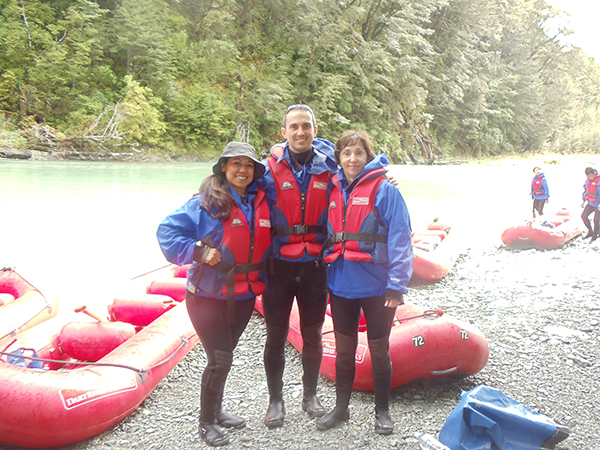 We’re wearing six layers of clothes to jet boat the Dart River in New Zealand. • Swimsuit, wetsuit, wetsuit booties, warm fleece pullover, heavy parka and life vest. Whoa! On the morning we had to layer all this gear, I was nervous before we even started the day! This was what we needed for our exhilarating jet boat ride up the braided channels of the Dart River. We then transferred to inflatable canoes for exploring Rockburn Chasm and other remote areas. T-shirts and shorts for sailing on a catamaran at Abel Tasman National Park. • T-shirt and shorts. 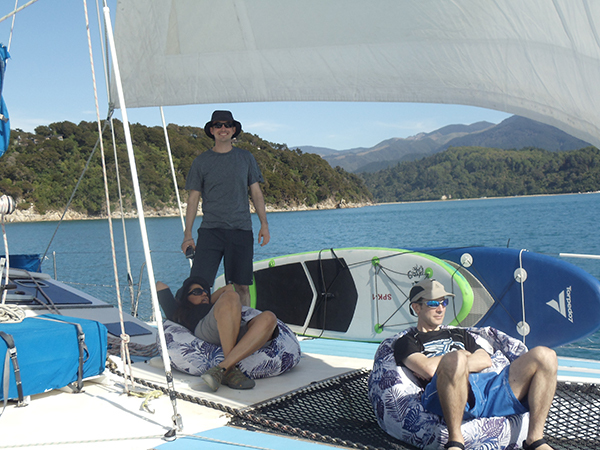 Our day of sailing with just our family on a big catamaran at Abel Tasman National Park was wonderful. Talk about gorgeous! 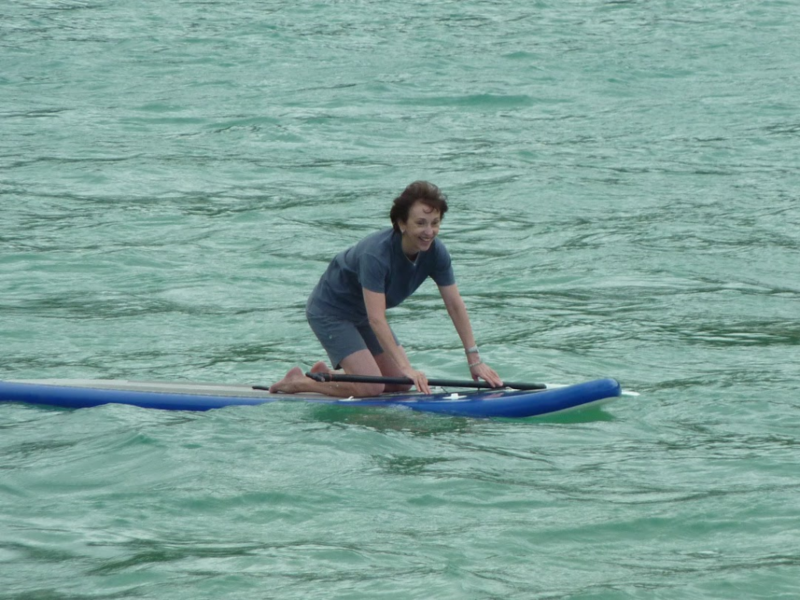 Our relaxation turned into work, however, when we were launched from the sailboat onto paddleboards. 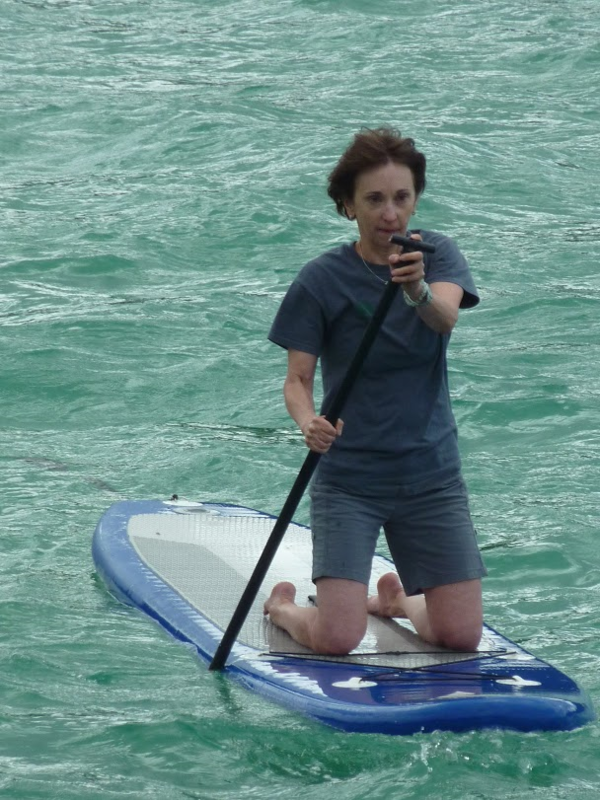 I had to work to paddle and try to keep my balance to avoid falling into the bay. Unfortunately, I didn’t paddle fast enough to get back to the boat when the tide was going out. So somehow the boat – my ride home – and I got separated. As the water receded, it left a very shallow separation between the sailboat and me. My family thought it was hilarious. A rescue boat had to be launched to come get me. My husband told the catamaran captain that a rescue attempt might be useless as I am stubborn and wouldn’t want help. Darn, I hate it that he knows me so well. • Jeans, jackets and tennis shoes. We wanted to be comfortable when we visited a sheep farm. New Zealand is truly a land of sheep. Did you now that there are six sheep to every one person in New Zealand? Being in the apparel business, I’ve always known of prized merino wool, so I was happy we got to see merino sheep up close. 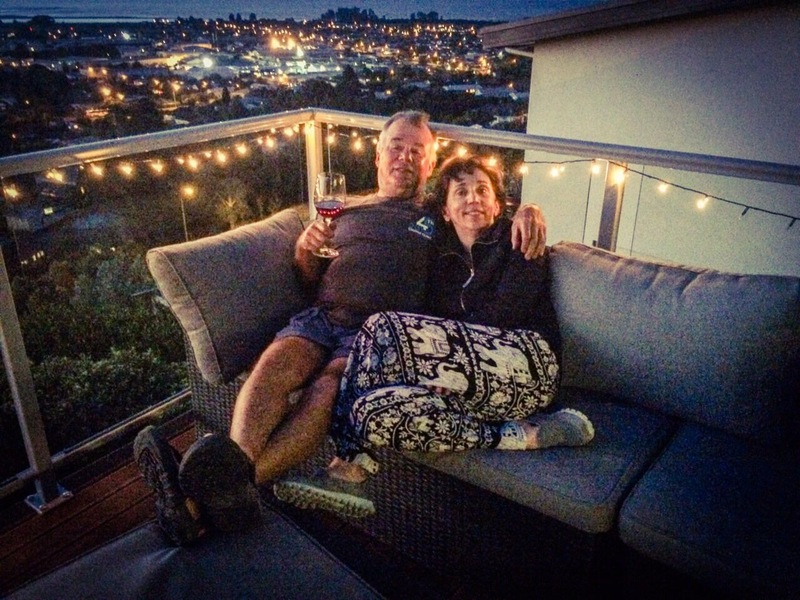 My husband, Sam, ever the outdoor wear enthusiast, purchased a base layer merino tee for skiing made by Icebreaker, a New Zealand performance outdoor apparel company that has quite a presence in the U.S. and globally. I’ve been told merino wool is breathable in the summer, yet insulating in winter, but I didn’t know how that could be possible. Well, it turns out that merino sheep live in the extremes of New Zealand’s Southern Alps, where it is freezing in the winter and beastly hot in the summer. No wonder the sheep evolved to have very different summer coats and winter coats. I also learned to pay attention to the micron or thickness measurement of merino fibers. Lower numbers are silkiest and finest. • Lounging PJs. Finally in the evenings we would do something for which my fashion career more properly prepared me. I got to relax in my pajamas! Because we had a family group of eight – daughter and son-in-law from Thailand and their two kids; son and daughter-in-law from France, with Sam and me – we chose to go the Airbnb route and rent homes in each locale, instead of pigeon-holing ourselves in separate hotel rooms. Oh, my gosh! It was a very good way to travel. Every home had spectacular views. Hanging out with a glass of wine on the deck or in the living room in the evenings was a great balance to our adventure-filled days. 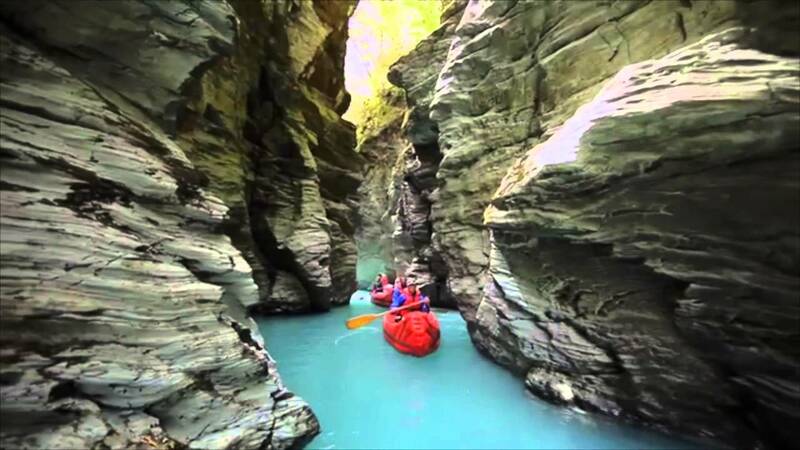 If you’re considering a trip to New Zealand, be prepared. Who knows what kind of clothes you might need for your own adventures on this beautiful island!